US PORTS: They are seeing steel throughput decline sharply. American Institute for International Steel says initiative is first of its kind against section 232 measures. Section 232 tariffs on imported steel and aluminum have already created collateral damage for US industries. US steel-using manufacturers are seeing price increases of 50 percent or more. US steel-using manufacturers are having difficulty obtaining the steel they need, whether domestic or imported. The American Institute for International Steel is about to file a lawsuit which will challenge President Donald Trump’s constitutional authority to impose Section 232 tariffs on imported steel. Trump’s tariffs on imported steel and aluminum have already created significant collateral damage for United States industries, according to the AIIS. 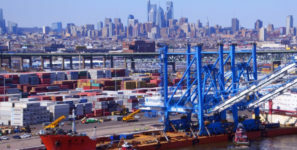 US ports and steel importing companies are seeing throughput decline sharply, says the Washington-based trade group that advocates for steel imports. Meanwhile, according to Richard Chriss, president of AIIS, US steel-using manufacturers are encountering product price increases of 50 percent or more and are experiencing difficulty in obtaining the steel they need, whether they buy domestic-sourced or imported steel. That’s why the AIIS is launch of a legal challenge this morning “that seeks to remedy a situation that is bad for the American economy and American workers alike,” said an AIIS statement. AIIS’s lawsuit will mount a constitutional challenge in an attempt undermine the president’s authority to impose tariffs on steel and aluminum imports unilaterally and without an act of Congress. The group will argue that the Trade Expansion Act of 1962 improperly delegates those powers to the president. Section 232 authorizes the president to impose tariffs to protect strategic industries that are deemed essential to national security. “Section 232 allows the President to consider virtually any effect on the U.S. economy as part of national security,” said AIIS President Richard Chriss. The AIIS lawsuit alleges Section 232 allows the president “unfettered discretion” to impose unlimited tariffs and that the legislation lacks any “intelligible principle” to limit that discretion. The AIIS complaint also rests on the constitutional principle that the Trade Expansion Act violates the doctrine of separation of powers and the constitutional system of checks and balances.